It’s been quite a week in the world of running. Even though I did precious little ACTUAL running, I did manage to get to a Body Pump class, and strength work is very important in improving performance. Firstly, I changed my car. The little yellow Fiat 500 (Travis was its name) was very cute, and lots of people remarked that it was very “me”, but it was just too small to fit 2 large dogs in any way comfortably. Minnie could fit in the boot, but it was a tight squeeze, and she had recently discovered that she could climb over into the back seat and beyond, which is just not safe. Max could fit in the back seat with a seatbelt attachement, but it was a real palaver to get everybody in and out. My main criterion when looking at a replacement car was the height of the sill into the boot area. Many cars that would otherwise be great canine-friendly vehicles failed on this test. And it was almost by chance that I happened upon the Nissan Note, but after taking it for a test drive I was pretty sure this was the car for me! Both dogs fit comfortably in the back, and even Max jumps in without too much cajoling. Little dog usually lives up to her nickname of “Moaning Minnie” in the car, but the whinging is definitely at a lower level, now that she has room to turn around and find a good spot. As it is a blue Note, its name is Harold Melvin. Next, I was featured in the parkrun UK weekly magazine, as “parkrunner of the week”. I have to thank one of the Wallace run directors, Michael Harris, for nominating me, and the feature was spotted by parkrun chums on Mumsnet, h2g2, and Twitter. My Mum was of course enormously proud, and is showing it to everyone. During Monday night’s training run, my headphone batteries died, so I had to resort to other distraction techniques. I like playing with numbers in my head (I loved the Irish Eurovision entry last year of this name – shame it didn’t do better!) and I started working out how many parkruns Minnie has done with me. Some were obvious – she hasn’t done the far flung ones like Derry or Limavady, and she hasn’t done any in Scotland or England. MUSA is a no-dog run, and I knew there was one Bangor run I’d been without her as I was doing my sighted guide training. The only question mark was Wallace. She’s done MOST of the 72 runs that I’ve clocked up there, but not all. I reckoned a generous estimate was that she’d missed 10 of them. So she’s done over 90 in total. I will be making her a 100 vest when the time comes, but meanwhile, I reckoned I could turn the purple T shirt she wore last week to Liz’s 100th run into a club vest. It’s fun to run at the Wa—-llace parkrun! So I ordered the letters DOG LISBURN from Amazon, and they arrived in time for me to iron them in place. So now we had the attire, and the right mode of transport, where would we go? Ecos and Bangor (both high on my list of “events where I’m sure I could run faster than last time”) were having birthdays, complete with cake. Wallace was having its monthly pacer session, but it was the news that Stormont had re-measured its course, and it was now a good 100m shorter, that proved the most persuasive. The weather was not kind, and it was damp and miserable. As we parked up in the hotel’s capacious car-park, and elderly gent joined us, admiring Minnie’s outfit. He was pretty new to parkrun, so I gave him a rough idea of the course, but took him to say hi to the volunteers. 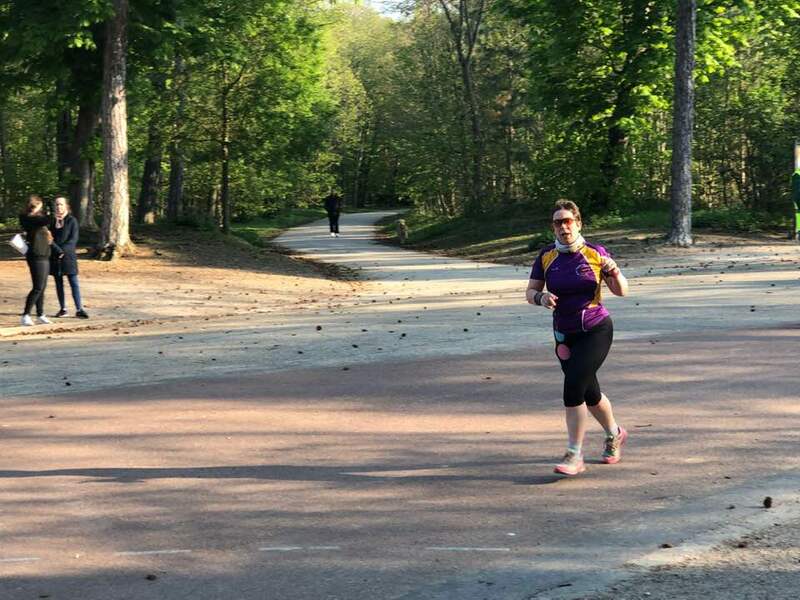 A few people recognized me from the parkrun newsletter, and I recognized a few people and dogs from other events. All the purple ladies, all the purple ladies, now put your hands UP! The run itself went smoothly – I felt my pacing was pretty good, I wasn’t over-pushing myself too early, and Minnie’s impetus up the few hills was working well. My previous best time here was 26.40, so I was hopeful that the shorter course would see me in the 25s. As it was, I even managed to break 25, and came in as 4th lady in 24.56, with the 3rd best aged-graded percentage of the day. Gotta love age-grading: as with many things in life, the trick is just to keep going. Fellow Waggy-racers Claire and Cash (named after Johnny…) were first female finisher -well done! Well done Claire and Cash! Strangely-appropriate-song on shuffle was “C-lebrity” by Queen with Paul Rogers, with the line “I wanna get my features in magazines” making me smile.